On this cool, rainy day along the Budongo Trail at the Edinburgh Zoo, before approaching the exhibit we stumbled upon a gorgeous, elaborate wooden bench where you can sit beside beautifully carved out chimps. I loved it, it was a great piece. Before venturing into the building and out of the rain we strolled past the outdoor enclosure for the chimps which with its varied and lush vegetation, water and climbing structures I thought this was a fantastic enclosure. What better way to spend your time on a rainy day then chilling and snacking indoors? And that’s exactly what these chimps were doing. Some were snacking on vegetables while others looked deep in thought and one in particular was poising, cool as a cucumber, laying on his back, legs bent and arms behind his head, it was like the missing link staring you in the face. I couldn’t help but be struck by our similarities, and this feeling only intensified when I turned to see one sitting and looking directly at me, we locked eyes and I felt overwhelmed as I always do when I have a moment with an animal where I can feel a connection to them. It’s these moments that propel me to do what I can to help save species worldwide and their wild spaces. 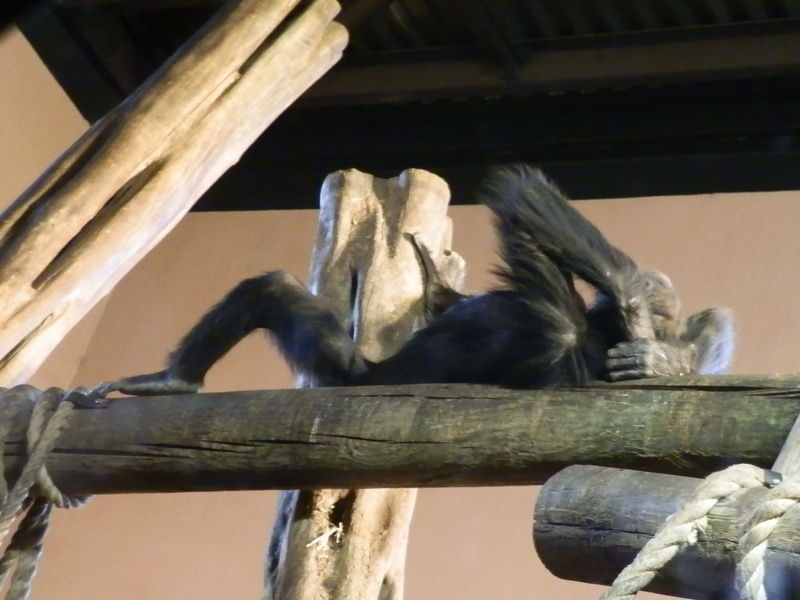 A cool feature about this exhibit is a glass tunnel that runs between both enclosures, right over visitors’ heads, where the chimps can travel between spaces or simply hang out in. Another great addition is an amazing statue that stands in the middle of the exhibit. 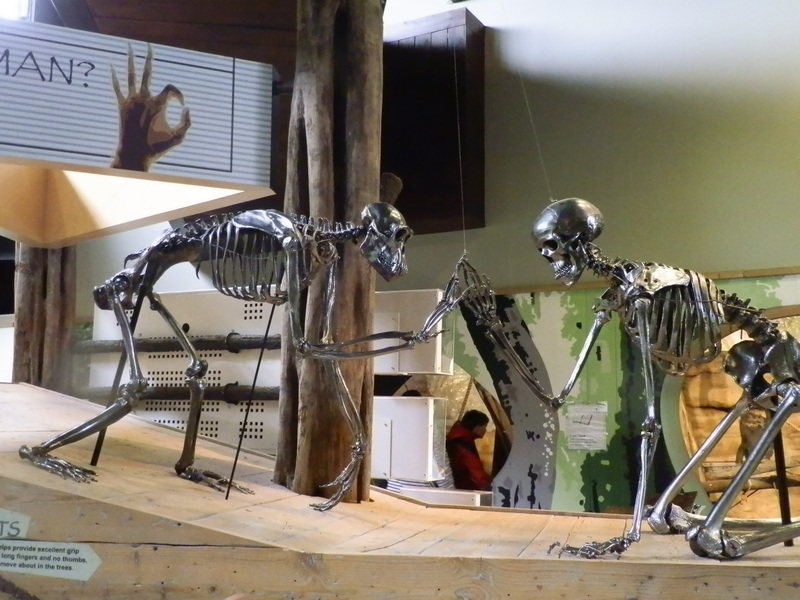 This metal statue represents a skeleton of both a chimp and a man, both on all fours, like a mirrored image each reaching out to touch the other’s hand, is a moving and thought-provoking piece of art. From the art of the human to the art of nature, we headed to the Brilliant Birds exhibit. Upon entering we first met leaf cutter ants, who were climbing along a rope that was strung from an enclosure, out and overhead with pieces of leaf cuttings that were larger than them. Leaf cutter ants are a remarkable species forming the second largest complex animal societies on Earth, next to humans. These ants can carry pieces of leaf that are twenty times their own body weight which is comparable to a human carrying a one ton load. Top that! In the building that houses the Brilliant Birds exhibit there is a variety of animals from blue poison arrow frogs to sun beetles to yellow-footed tortoises. Then you open the door that opens into a large walk through aviary that is home to a plethora of brilliantly beautiful birds like; the Bali starling with its stark white colouring, blue eye shadow and trendy mohawk, the bleeding heart pigeon with a red thumbprint on its breast that gives its name, and the closest living relative to the dodo – the Nicobar pigeon with its iridescent feathers. 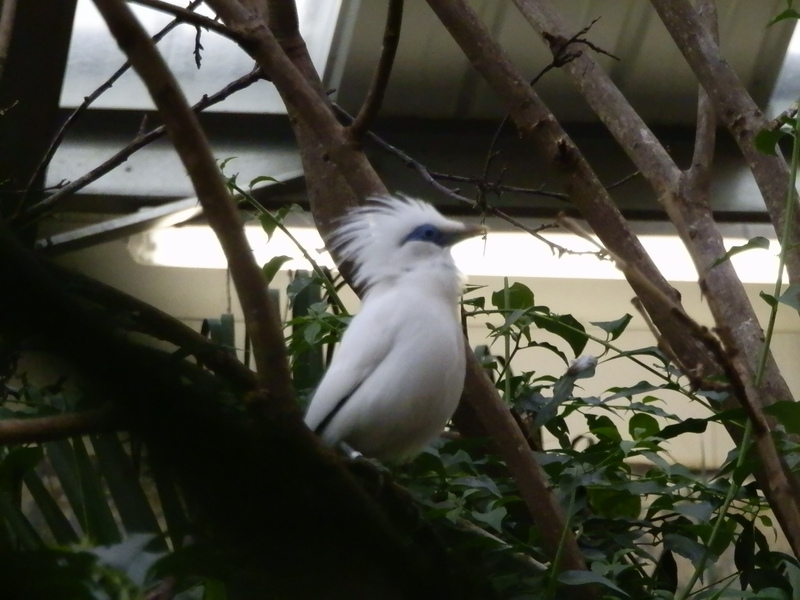 The ability to actually walk along the boardwalk through the Brilliant Birds aviary while these beautiful birds fly over head, perch on the rail beside you or strut across your path is a highlight of any zoo visit, to be among the wildlife you truly feel wild at heart. Thank you so much for providing individuals with such a marvellous chance to read in detail from this website. It’s always so fantastic and as well , jam-packed with amusement for me and my office acquaintances to visit your site no less than thrice in a week to find out the fresh secrets you will have. Of course, I am always pleased considering the fantastic advice served by you. Some 1 facts in this post are absolutely the best we have had.